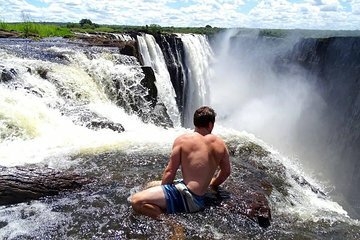 On this ultimate Victoria Falls guided tour, you’ll get up close and personal with the world-famous natural landmark by hiking, rappelling, and boating. Get close enough to feel the spray from the roaring water. Then, hop a raft to paddle right underneath the falls for a rare first-hand peek at the foot of the iconic cascade—topped off by a refreshing swim under the mists.